Dr. William R. Bertelsen of Rock Island, Illinois,practiced medicine at Moline Public Hospitals in Moline and later became Medical Director at Moline Hospital's Trauma Center. In 1985, he founded the Immediate Care Center for Moline Public Hospital. Prior to graduating with an Medical Doctor degree in 1947 at the University of Illinois College of Medicine, (while serving as a US Navy Reserve Leiutinent Junior Grade), however, he studied Mechanical Engineering at Indiana Institute of Technology for more than two years. Inspired by the exciting research on vertical take-off aircraft, he developed and became a world pioneer in the development of air cushion vehicles. 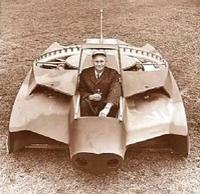 He invented the Aeromobile in 1958, which is credited as the first hovercraft to carry a human over land and water. He also originated the Arcopter concept for vertical take-off aircraft. In the late 1960s, he developed the most significant advance for air cushion technology - The Gimbal Fan - which gave hovercraft more stability and controllability. His 32 domestic and international patents include the Aeroplow and Aeroduct system of Mass Transportation in 2002, the World Hovercraft Federation presented him with their Excellence Award in recognition of his work as inventor of the Air Cushion Vehicle. The early Aeromobile models are part of the permanent collection of the Smithsonian Institution in Washington, D.C. Dr. Bertelsen was an Associate Fellow of AIAA. He was also a Fellow of both the British Hovercraft Society and The Canadian Aeronautics and Space Institute and a member of the Experimental Aircraft Association, the US Hovercraft Society and Physicians for Social Responsibility. Dr. William R. Bertelsen died on July 16, 2009.